I knew that title would get your attention, you perverts! More like my jewels. My jewelry. And the disorganization thereof. All my jewelry is kept right here. On my bureau. In this hodgepodge mishmash. Let's zoom in for a closer look, shall we? 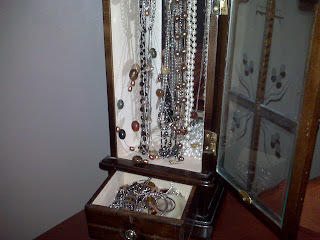 This is where I keep my rings and (some of) my necklaces. (And, of course, the requisite "Mom" multicolored beaded bracelet I got as a Mother's Day gift from one of the boyz.) All stored on a random heart plate. Yes, everything is always tangled together. Yes, I forget what I own. Here I have my watches and bracelets stored in a cheap keepsake box that has a $1.99 pricetag on the bottom. Earrings. Kept in this Lenox keepsake box that I received as a wedding shower gift. Even more necklaces. Stored in this tiny jewelry box that I got as a hand-me-down from a friend. Clearly, I'm in need of some sort of help. Send me your jewelry storage expertise. Send me links. Send me pictures of where you keep YOUR (family) jewels. Heh. Oh, and P.S.? I always thought jewelry had another "e"-----> jewelery. That's how you SAY it anyway. But apparently not. 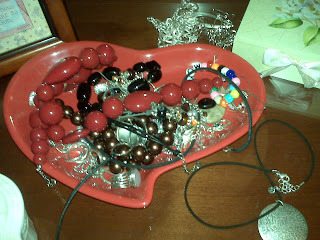 I too had a tangled mass of jewelry and oy it drove me INSANE!! 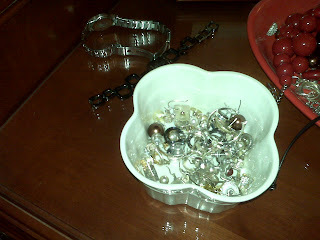 And you can pick up a little line of regular hooks at Target for maybe $10 and it'll organize your necklaces/bracelets. As far as earrings, I have mine in ice cube trays and a craft tray I got at hobby lobby. That way it always keeps them with their partner. Good luck with the organization! I'm the worst at keeping it up! I am really looking forward to hearing the responses you receive. Sadly my jewelry looks a lot like yours! The Safekeepers are nice because your silver needs less polishing. I had the same problem, but hubby got me the armoire one year and now everything is organized! First: have the same beaded bracelet from my little ones. Are you sure that's yours? Second: love that lia sophia piece. Third: I found a nice fabric "tray" at Target with one long center section I use to layout necklaces and 6 smaller ones that I keep earrings, smaller necklaces and bracelets. I'm sure it's not supposed to be for jewelry but it works and sits on top of my bureau. Next step: graduate to the jewelry chest or closet(JCPenny always has a ton of options) but those take up a lot of real estate in the bedroom. I keep most of mine in the boxes they came in, in one giant box. Not pretty but nothing gets tangled! Wal-Mart doesn't carry it right now becuase it was a Christmas gift from last year, but I am sure you can search the interwebs and find on similar. I love it. I no longer have tangled anything unless I am lazy and don't hang up my necklaces or bracelets. Too embarrassed to send photos. 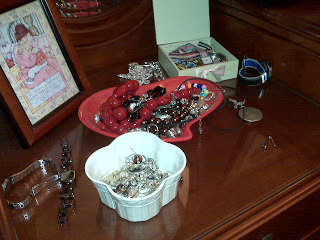 Let's just say your jewelry is treated way, way better and 100 times more organized than mine. I just got a jewelry armoire and am embarrassed to say I have not yet transferred all of my jewelry to it! And I don't have very much really, but it is all over the house! So, like, I'm a visual person, right? And I, uh, live alone? 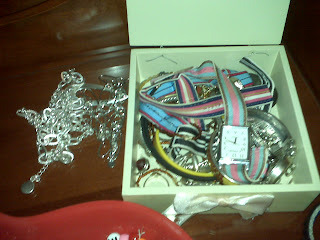 So, all of my jewelry is spread out across the top of my dresser. Because if I don't see it, it doesn't exist and I don't wear it. I use various trays and dishes to keep it somewhat organized - I'm not a total madwoman. I just has my husband make me a necklace hanging organizer. He used a bunch of those gold little hooks and a piece of wood. He screwed those hooks in two rows and mounted it on my wall. It's SO much better than it was before!